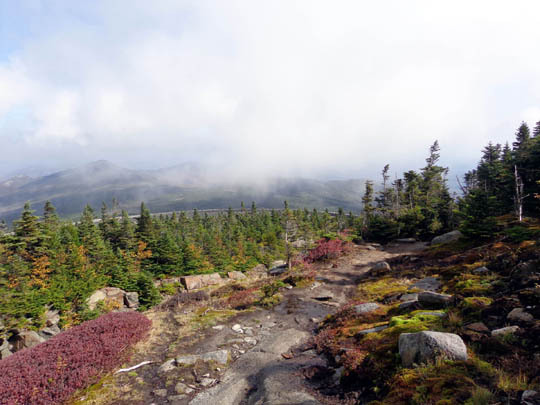 don't miss Whiteface Mountain, the fifth-highest peak in New York." 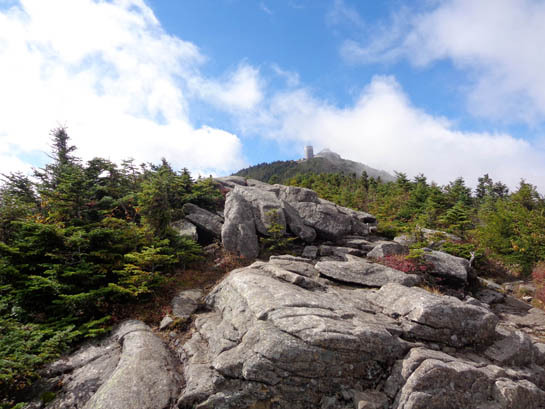 At 4,867 feet, Whiteface is one of the Adirondack 46 High Peaks, mountains ranging in elevation from just below 4,000 feet to 5,344 feet in elevation. You can read all about the ADK 46er club here. 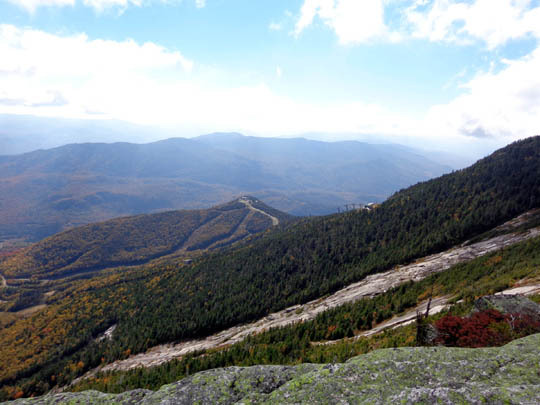 Its purpose is similar to the AMC's 4,000-Footer Club in the White Mountains of New Hampshire, where 48 peaks top 4,000 feet. 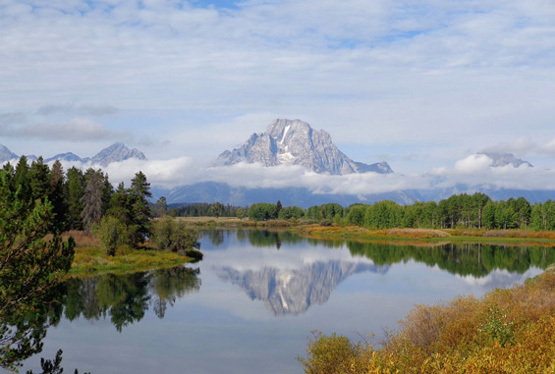 It is the goal of many hikers, particularly those who live in or close to these states, to climb all of these peaks either during their lifetime or within a certain period of time. 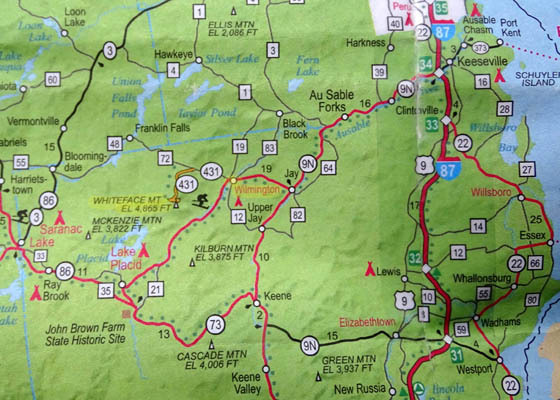 Also note the proximity of Whiteface Mountain to Lake Placid, site of the 1964 Winter Olympics. 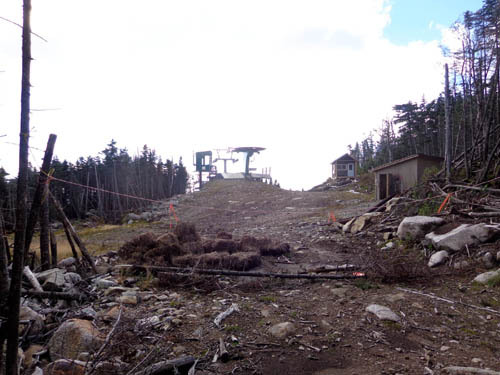 I saw remnants of ski lifts and runs on the eastern side of the mountain as I climbed it. 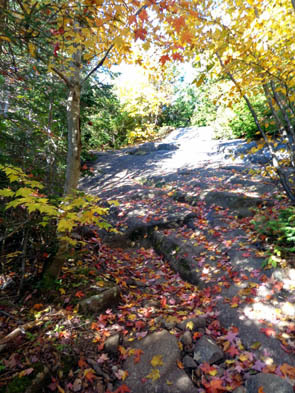 THERE ARE EASIER WAYS UP THIS MOUNTAIN . . .
. . . than hiking up about 3,000 feet on one of its trails. 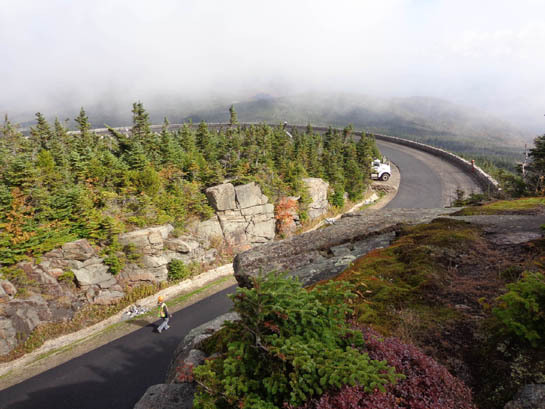 You can pay $16 to drive a motorized vehicle up the paved road to the parking area 300 feet below the summit, then take an elevator -- or short, steep rocky path -- to the top. We did that, too, so Jim could see the amazing views from the summit. 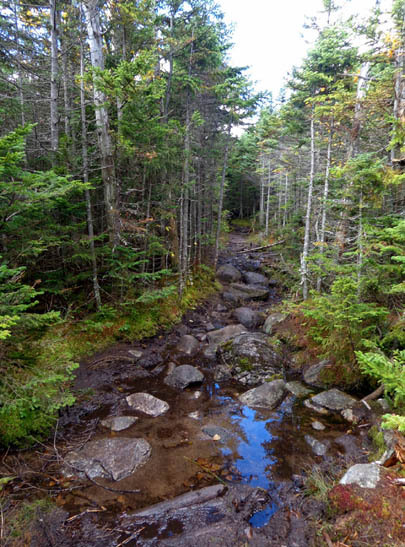 But first I hiked up there on what is described as the primary trail of four paths that lead to the summit. It's not an easy trail and I saw very few other hikers. I liked the solitude. The trail below tree line, not so much. It was very rough and had few views. Usually on a pretty day like today there would be hoards of people driving up the road and milling around the summit. Right now, however, the road is open only on the weekends due to road construction so I had the mountain mostly to myself on this weekday -- and the crews who are repairing the road. More about them later. I'm going to go into some detail about this hike so others will know what they're getting into. I have enough photos to divide the entry into two pages. If you don't want to read everything feel free to just scan the photos. Today was beautiful -- mostly sunny, some morning fog and clouds clearing up before noon, warm (mid-70s F.), minimal breeze. Since Jim has a bike race tomorrow he opted out of this hike (wise move). I hiked solo. 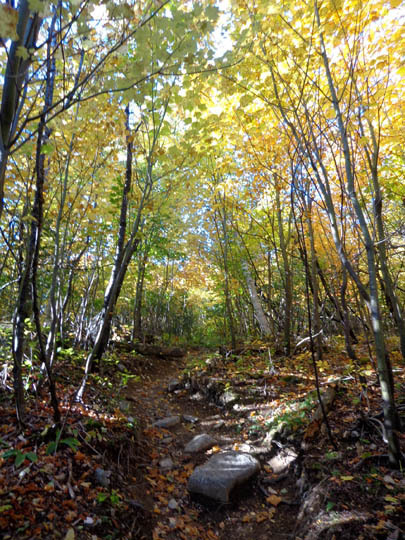 Although I didn't know the poor condition of the trail I chose, I did know the ascent and descent would be too long for 11-year-old Cody and too hard for me to hike with rambunctious young Casey. then rose over the next four miles to 4,867 feet at the summit. I reached the summit about 11:30 = over three hours to hike only four miles. I took a lot of pictures but didn't take any long breaks. 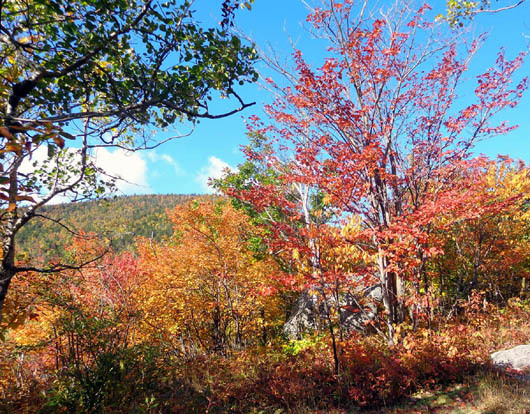 The leaves were still pretty green at the lower elevations. 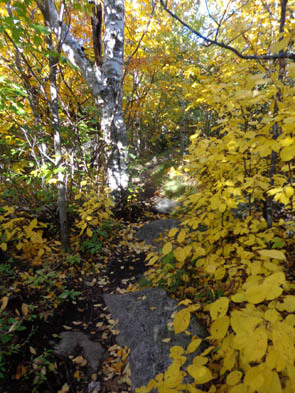 As I climbed higher the leaves became increasingly colorful, as you'll see in the succession of photos that follow. The trail also became more gnarly pretty quickly. Most of the first mile was very steep and rough up a former ski lift slope. 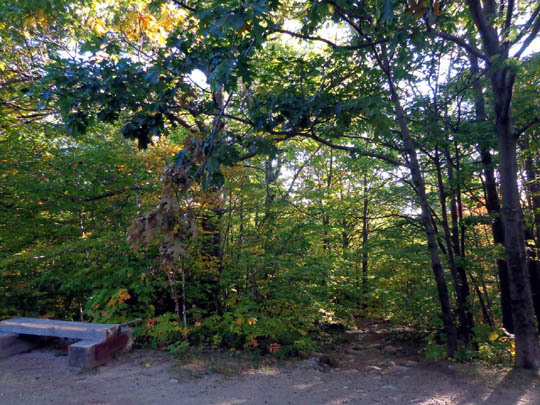 There were large concrete blocks on either side of the trail about every 1/10th mile where the structure of the lift was supported. 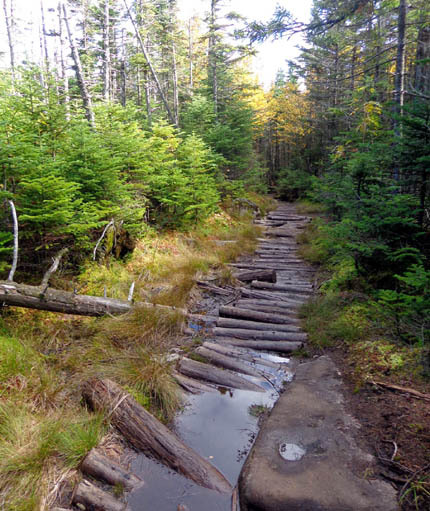 It came down in the 1950s and now the forest has grown up around what's used as a trail. 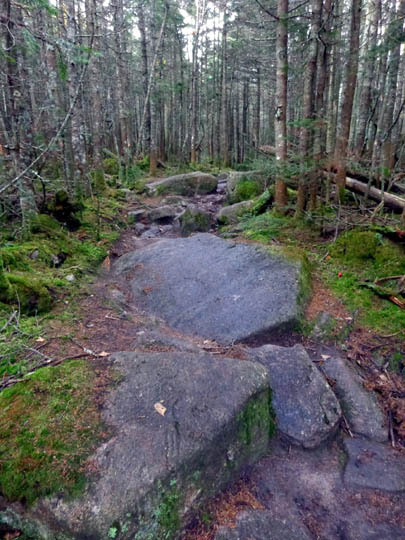 The "trail" looked more like a rock-strewn dry stream and I was determined not to have to descend on it. There are two other trails that go down to Hwy. 431 or 86 that I intended to take at the end. Even though they are longer than returning to ASRC, they are reportedly less steep. At the trail intersection at one mile for those other trail options I met two young male backpackers who spent the night nearby. After packing up their tents they caught up to me at the intersection for the trail to Lookout and Esther mountains, two other 4,000+ footers. 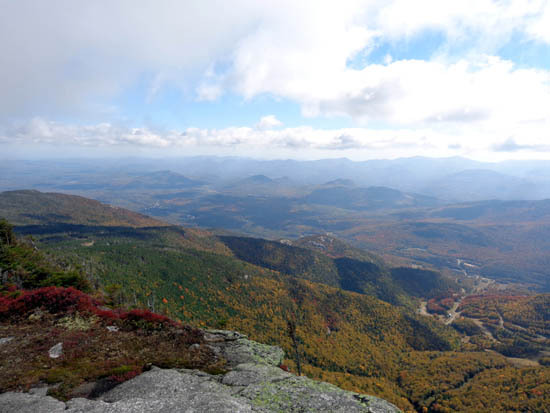 They are two of the folks who are trying to hike all 46 of the 4,000-footers in NY. As rough as the trail is, I didn't want to hike out and back on the trail to either or both of these peaks until I came down from the summit, in case I didn't have time for them. When I saw the guys later as I was descending from the summit they showed me a photo of a large black bear paw print -- they and a day hiker told me about the fresh bear prints on the saddle between Lookout and Esther mountains. Although none of the guys saw any bears, it made me realize I shouldn't go there alone without bear spray. 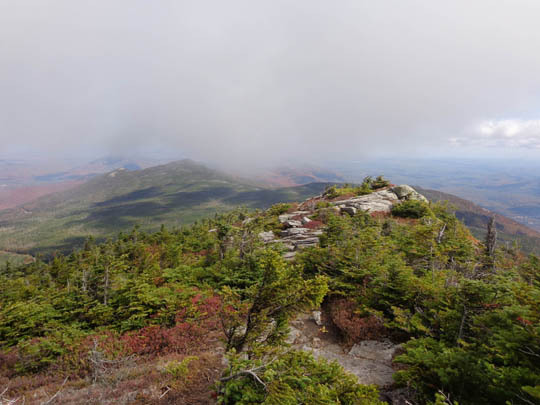 The second and third miles were partly along a ridge between Marble and Whiteface mountains. There were very few views because of all the trees. 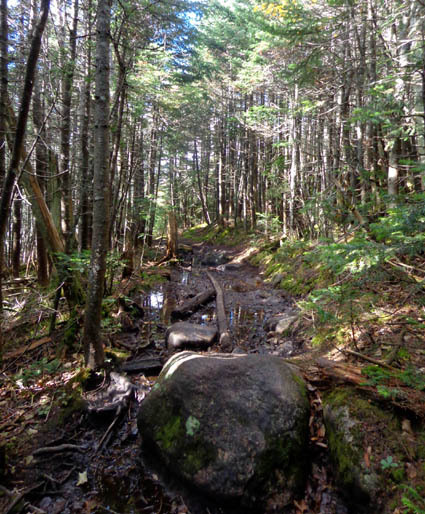 The trail remained rough most of the way, with large rocks, numerous roots, puddles, and mud along the ridge. The next series of photos is from this section. Not so bad yet . 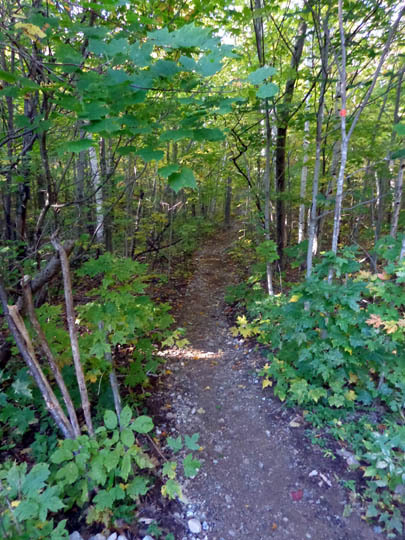 . .
With about 3/4 mile to go to the summit the trail passes right next to a large stone retaining wall along the paved toll road that goes up to a parking area 300 feet below the mountain's summit. 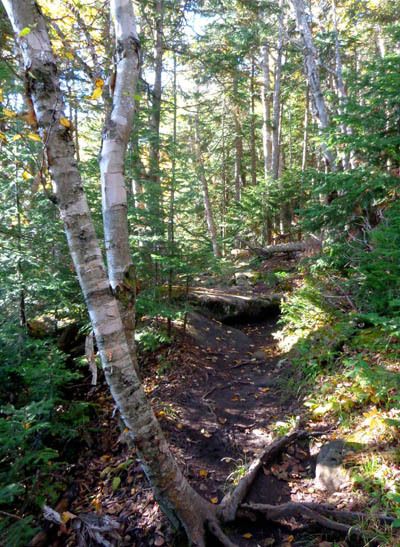 Sub alpine terrain just above the roadway; the trail is close to the road for a very short distance. I assumed no one was supposed to be on the road until tomorrow so I didn't even ask if I could walk up the road to the summit. I'm glad I didn't. 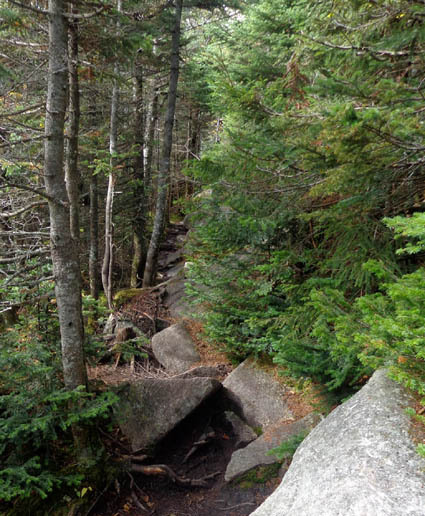 My favorite part of the trail was the next part above tree line where it wound over exposed rock ledges. I could finally see down into the valleys and up to the summit. 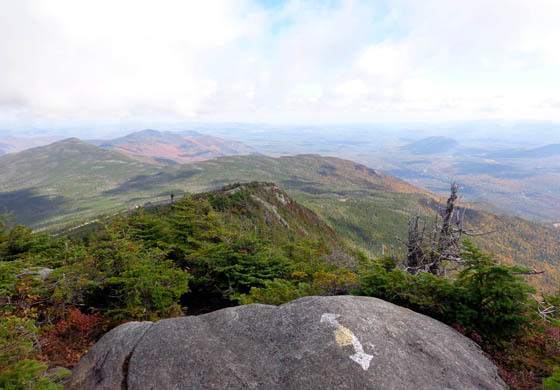 The rocks were easier to negotiate uphill when they became more smooth granite bedrock instead of large boulders -- and the views became amazing! 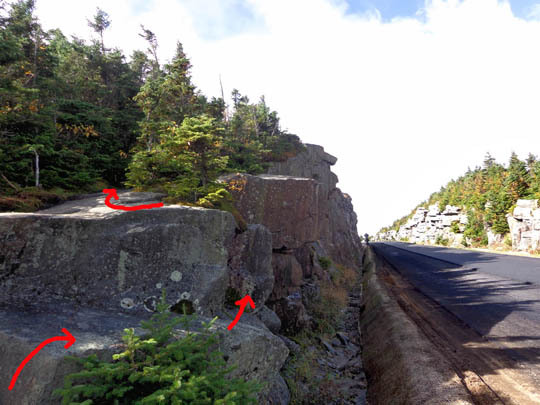 I saw the day hiker who saw the bear paw print coming down when I was on the exposed rock ledges. We talked for a bit and he told me no one else was at the summit. Cool! He was disappointed because clouds obstructed his views while he was up there. 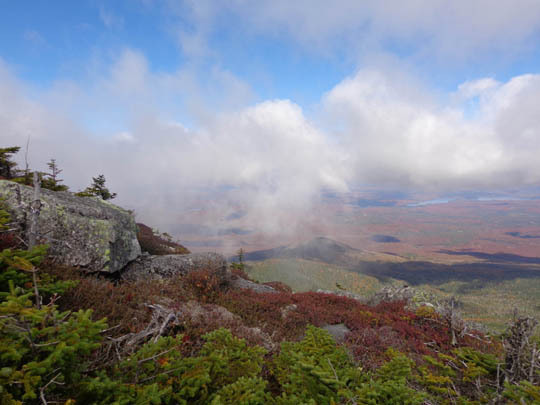 Some low clouds were still blowing through as I climbed to the summit but they were gone when I got there. They made some of my pictures even better. My timing was perfect. No more low clouds came in while I was there. 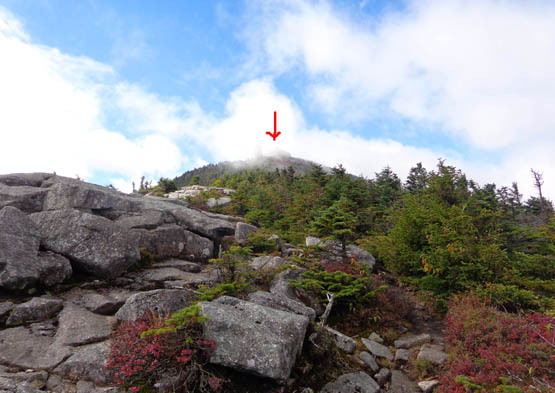 Summit photos continued on the next page, plus the descent -- how did I decide to go back down? ?